The competitive sport of wrestling is unlike any other. While it may look a bit rough around the edges compared to other contact sports, wrestlers have to follow certain regulations and rules to ensure that fighters don’t experience injury. One of the most important things to use while wrestling is the right gear. 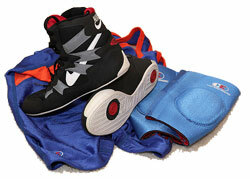 Wrestling gear includes safety equipment, accessories, attire, and much more. Whether you’re a new wrestler just starting a new training program or a seasoned athlete, bringing the right gear to every training session is key. To make lugging around supplies a bit more manageable, high-quality backpacks and duffel bags are available. A variety of options are available to hold wrestling gear. When searching for the perfect bag, there’s a lot to consider. Not only does it need to hold all of the essentials, but it’s also a good idea to consider the bag’s construction and style as well. To narrow down your search, here are some of the best wrestling duffel bags and backpacks on the market today. This duffel bag from ASICS is an affordable and high-quality option. It’s made entirely from polyester. This synthetic material is excellent is withstanding constant wear and damage. It’s fairly large in size, measuring roughly 30 inches in length. A sizable center compartment and interior pockets can accommodate an assortment of gear. Durable zippers keep everything contained for the haul. There’s a shoulder strap for easy transport and a handy identification tag. It’s not the flashiest bag on the market, but the black streamlined design will complement virtually any style. 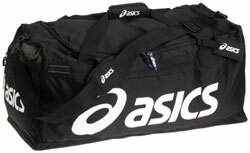 Also from ASICS is this smaller duffel bag. It’s roughly 19 inches in length, which is considerably smaller than the previous option. It’s made for wrestlers that don’t need to carry a ton of gear back and forth. It’s made from the same durable polyester. However, it includes an additional nylon web for containing loose objects and a mesh compartment for wet shoes or clothing. It comes in either bright red or deep green. Regardless of color, it’s a great choice for anyone wanting to limit their haul to the gym. 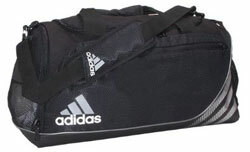 This large duffel bag is a great option that shows why Adidas is one of the leading athletic sports brands in the world. The bag measures 24 inches long, providing more than enough room for a full set of gear. It has a large main compartment, smaller zippered interior compartments, and outer compartments for easy organization. It has a waterproof bottom and uses odor-blocking technology in the interior fabric to keep it clean and fresh. With a variety of colors available, any guy can find the perfect style fit for all of their wrestling gear. 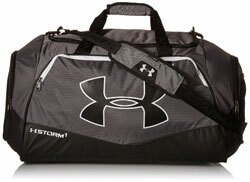 Guys looking for a large bag built for durability can look no further than the Undeniable II duffel bag from Under Armour. 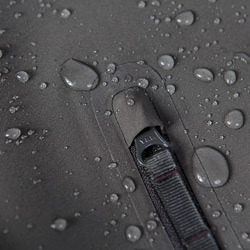 It’s made from 100% polyester and uses unique storm technology to make it tough and water-resistant. Even the bottom and sides are resistant to abrasive damage like scuffs and tears. It measures 29 inches in length and has plenty of storage pockets, including a large ventilated space for wet or smelly items. With a padded shoulder and hand strap, it’s a comfortable bag for any man. The gear bag from Brute combines the easy access of a drawstring bag with the comfort and portability of a high-quality backpack. The top main compartment is accessed with a drawstring. However, the front pocket is zippered. It’s made from 600D polyester throughout the main body, but the top handle is made from nylon. Mesh material is used on the sides of the bag to ventilate the inside compartment. The back of the bag and adjustable shoulder straps are padded for comfort. It’s simple in design, yet very effective in carrying the wrestling essentials. 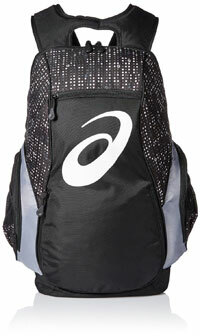 This backpack from ASICS is stylish and versatile. It’s large enough to hold a collection wrestling gear comfortably. Furthermore, it includes a plethora of pockets to stay organized. It has a large main compartment with pockets, two side pockets, a smaller felt-lined pocket, and front pocket made of mesh. All of these options allow any guy to stay on top of where their gear is. It’s made from durable polyester throughout and has shoulder straps that are both padded and ventilated for comfort. 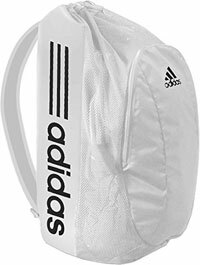 The Adidas wrestling gear bag is large and simple. It doesn’t contain a bevy of additional pockets, but it does have a large main compartment that will hold a lot of gear. Guys can simply open the drawstring compartment and throw gear in with no hassle. Mesh material is utilized for air circulation. There’s a large front zippered pocket as well for smaller essentials. Made from polyester, it’s available in a variety of eye-popping colors. The two shoulder straps are padded for comfortable use. From Under Armour is the Trance backpack. 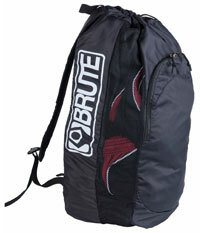 It’s a simple drawstring backpack that has a large single compartment. However, it’s not made from cheap materials. It uses thick polyester throughout and includes padding on the back and shoulders. There’s a smaller internal pocket with soft lining to hold valuables as you train. It comes in a collection of great colors and designs for high visibility. For those that train at night, the front of the backpack has a reflective logo. It’s a large and stylish option that can hold all of the must-have wrestling gear with ease. There are quite a few things to consider prior to choosing a wrestling gear bag. These bags will be used frequently and experience a bit of wear and tear. To avoid having to purchase a replacement anytime soon, it’s a good idea to consider the bag’s construction and style. The first thing to consider is material. Many manufacturers utilize different materials that vary in resilience and durability. A high-quality bag will use waterproof material like rubber or nylon as materials because it’s heavy-duty and doesn’t hold odors. Bags should also be large enough to fit necessary gear and accessories without being over or under-stuffed. The best bags will fit items perfectly. Designs with multiple pockets are best because they don’t waste space and make things organized. The overall design and style of the bag is important because it affects how it will be carried. This aspect of the bag is more based on preference. Duffel bags tend to be larger and contain a single shoulder strap for transport while backpacks are smaller and more portable. Guys should also go with a bag they’re attracted to aesthetically. Not only does it let them express their own personal style, but it makes the bag easier to identify. Bright colors and bold designs will stand out in a pile of neutral bags. New gym buffs are notorious for choosing a bag that’s less than perfect. There’re a few common mistakes that people make when shopping for a wrestling gear bag. The first is not examining the bag fully before purchasing it. Many guys just go with the biggest or coolest looking bag they see. Over-sized bags, while tempting, will only become a burden that allows gear to slide around inside. Guys need to pick up the bag, look inside, and plan how gear will fit. Another thing to avoid is going with the cheapest option available. Cheap bags are made with substandard materials that will rip and tear. Some are also cumbersome to carry due to a lack of shoulder straps or straps that can’t take the load. It’s better to go with a pricier bag when possible. It saves headaches in the future and will last much longer than the cheaper alternative. Having the right bag to hold wrestling gear can make all the difference. Most guys spend a considerable amount of money on their gear, so why not do the same to get the best bag to hold it all? 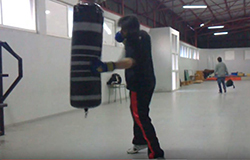 While it may seem like a nuisance to carry gear back and forth for training, a good bag will make it that much easier.